Click above to view full list of events this week. Undergraduate Research Week kicks off Monday to showcase students' work across a range of disciplines. The five-day event is free and open to the public, with the goal that non-research students and others interested in the work will attend sessions outside their areas of study, says Folashade Alao, co-director of Undergraduate Research Programs. "The whole week is really an opportunity for the Emory community to explore, celebrate and be inspired by the research that Emory undergraduates have conducted over the course of the semester and the year," Alao says. "The events this week underscore the vibrancy and diversity of undergraduate research on campus," she says. "It also shows how research, whether in the class, as a research assistant or done independently, is an integral part of the Emory undergraduate experience." Events for Emory College start with the Neuroscience and Behavioral Biology Symposium from 3 p.m. to 6 p.m. Monday in the Woodruff Health Sciences Center Building. A Psychology Symposium will be held from 4 p.m. to 7 p.m. Monday in the Psychology and Interdisciplinary Sciences lobby and Room 280. Also Monday, starting at 5 p.m. in Room 208 of the Schwartz Center, a faculty panel will offer insight into the research behind various artistic works. On Tuesday, interdisciplinary students will present their exhibits and archival research from the course "Resisting Racism: From Civil Rights to Black Lives Matters," at 1 p.m. in the Rose Library Teaching Room. 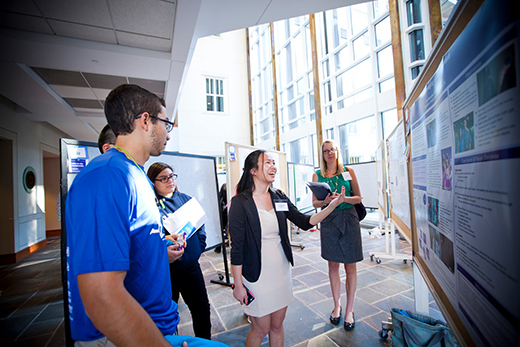 A Biology Symposium will be held from 2 p.m. to 4 p.m. Tuesday at the School of Medicine, and students will present their original artwork in the Visualizing Creativity session from 6 p.m. to 7 p.m. in the Few Multipurpose Room. A campus-wide Research Symposium will be held from 3 p.m. to 6 p.m. Wednesday in the Coca-Cola Commons at the Dobbs University Center. A drop-in discussion with faculty, "Professors at Kaldi's Getting Coffee," will run from 3:30 p.m. to 5 p.m. at the coffee shop. Undergraduate research spanning multiple disciplines will be presented in oral discussions and poster sessions from 3 p.m. to 6 p.m. Thursday in the Coca-Cola Commons at the Undergraduate Research Programs Symposium. The week concludes with short talks and a poster session with chemistry honor students from 3 p.m. to 6 p.m. Friday at the Atwood Science Commons. 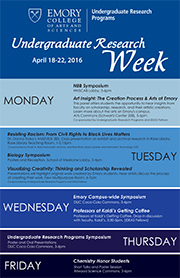 Emory's Oxford College campus is also celebrating Undergraduate Research Week with a symposium on Friday from 12-4 p.m. in the Akin Room of Oxford’s student center. The symposium features presentations from participants in the Oxford Research Scholars Program, which affords selected students the opportunity to work directly with faculty members on disciplinary research or projects related to the scholarship of teaching and learning. Research proposals can come from any academic discipline. “In 2002, the first year of the Oxford Research Scholars Program, four students participated. This year, 18 students took part," says Alicia DeNicola, associate professor of anthropology, who directs the program. "We are very excited about this growth and Oxford’s commitment to providing experiential learning for our students."